We've got a nice pair of "short-but-sweet" Fiat albums to share over the next week, thanks to Bonhams auctioning off some very cool Italian classics from the Maranello Rosso collection. Sadly, the cars aren't able to be shown in as much detail as we normally like here, but the few studio images that are included are simply excellent. This Fiat-Abarth collaboration came as a surprise to the folks attending the 1966 Turin motor show. 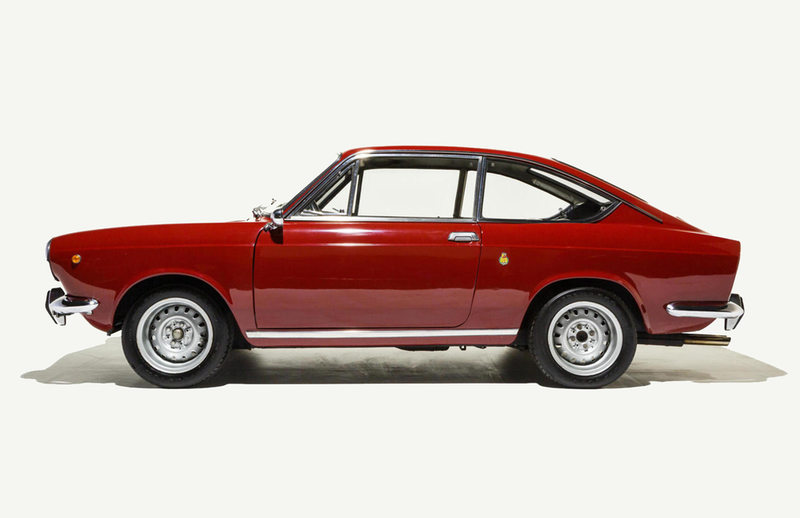 Fiat had taken the 850 Coupe body and the 1200cc engine from the 124 Saloon, and called up the blokes at Abarth to do what they do best to produce a more lively performer than the standard 850 Coupe. The team famous for tuning road vehicles and building race cars took the 124's stock 59hp engine and sought to find more revs, boring out the cylinders to 75.5mm and reducing the stroke to 71mm. Now 1800cc and running compression of 10.5:1, the car made a much livelier 75hp at 6,000rpm - not much by today's standards, but the car only weighed 760kg (1675lbs) so it was a significant upgrade in performance. If you're interested in reading more, or potentially making a bid, you can check the Bonhams listing here.